Trumpler 5 golden cluster with the Cone and Christmas Tree and IC2169...and "not" a comet. Center stage is Trumpler 5 an open cluster of golden stars some 3 billion years old. Upper left is the Cone nebula and Christmas Tree nebula....bottom left is not a comet, but rather Hubble's Variable nebula. 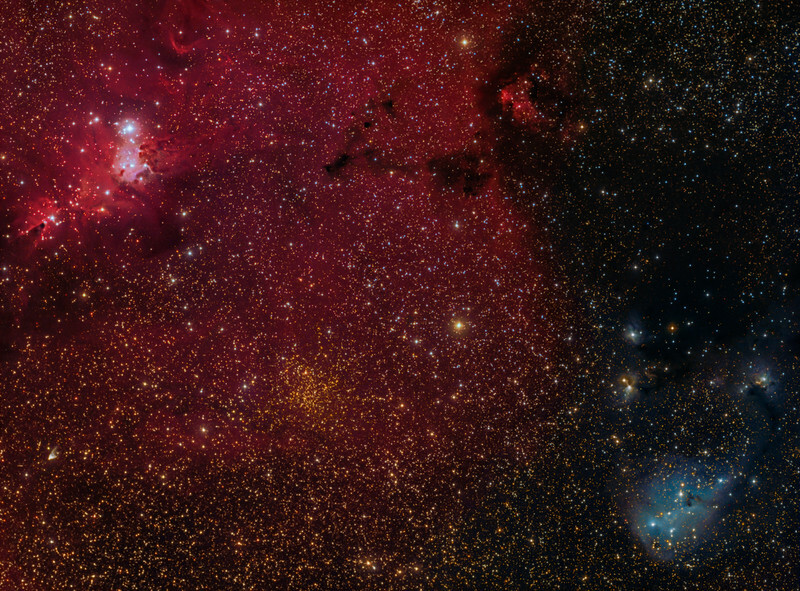 Bottom right is the reflection nebula, IC2169. Image taken by Lynn Hilborn, Whistlestop Observatory, Grafton, Ontario on Nov 23, 29 and Dec 3, 2016. Teleskop Service Imaging Star 71 @f5 and Moravian G2-8300 with Baader filters.